To help avoid errors when making a donation, please be certain that you have entered the correct information in each required field. When asked about entering your CVV code, that is either a 3 digit or 4 digit number located on your card. If you are experiencing problems with your preferred card, please check with your card services institution to help resolve any issues. Click here to make a Secure Donation with Paypal. 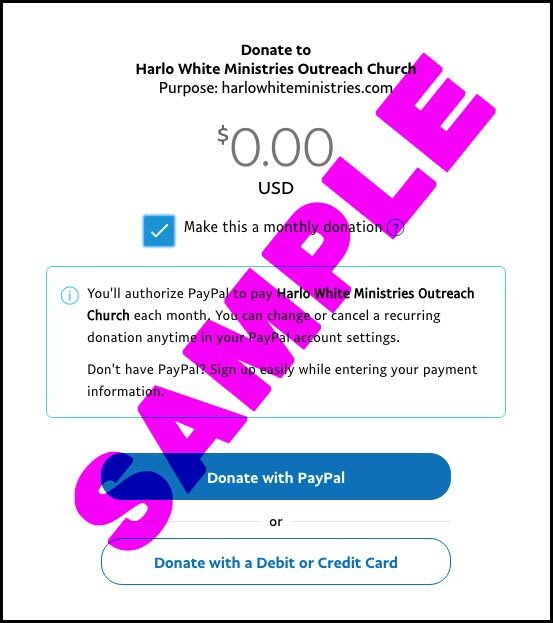 If you prefer to use Paypal, you will be taken to the Paypal donation page for the Harlo White Ministries Outreach. Once complete, Paypal will send you a receipt via email that you have successful finished the transaction. You will either return to harlowhiteministries.com automatically or you can return manually be inputting the web address when complete. Just select the "Make this a monthly donation" check box. You'll authorize PayPal to pay Harlo White Ministries Outreach Church each month. You can change or cancel a recurring donation anytime in your PayPal account settings.